Thanks for helping to choose the name, logo and uniform for Canberra’s newest school. As an important facility for the whole North Gungahlin community, we asked for the views of local families, teachers, parents of school children, community organisations and the broader Canberra community . We received your feedback, from 30 May to 13 July 2018, through online voting, resident drop-in sessions, emails and social media which helped us finalise the different aspects of the school’s visual brand. To see who we heard from and key insights from the community, check out the What We Heard report [PDF], [word]. A new school is on its way in North Gungahlin, in the suburb of Taylor. As the first community facility within Taylor, the school will educate children from Taylor, Moncrieff and the future stages of Jacka while providing amenities for hire by local community groups and organisations including a school hall, oval and modern meeting rooms. 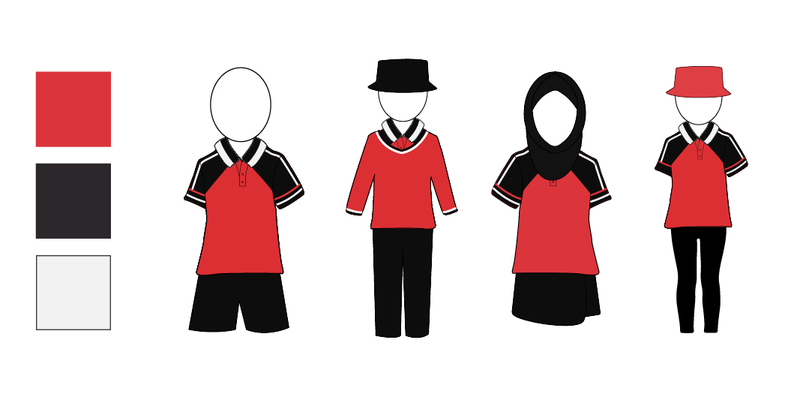 We asked the community to choose the name, the logo and school uniform. For updates, questions regarding the school or enrolling your child, check out Education's Margaret Hendry School information page. This new modern school facility will cater for 176 preschool and 600 primary school students when it opens for Term 1 2019, providing capacity for quality public education in this high-growth region. The planning will also allow for the accommodation of an additional 150 primary school students, and potentially a year 7-10 expansion if required to cater for future growth. 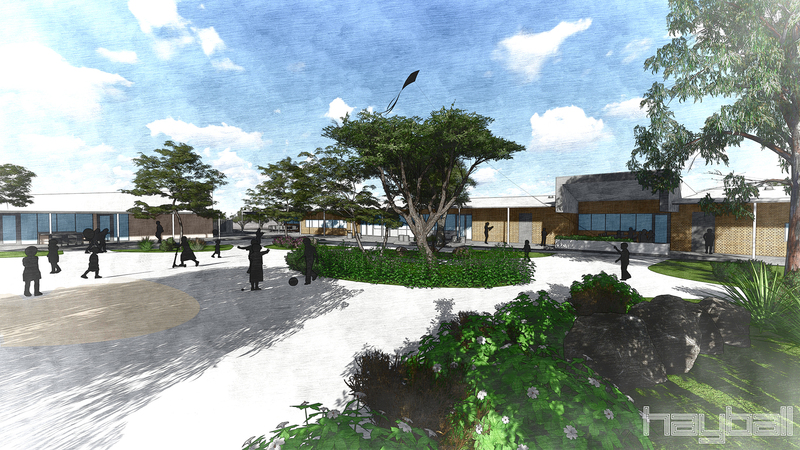 The school will be the first community facility provided in Taylor, including two playing fields, and the wider community will be able to hire the school hall, oval and meeting rooms for a range of activities and gatherings. The new school will also include a resource centre, canteen, out of hours school care facilities, and great outdoor learning and play areas. Like all ACT public schools, the new school will deliver the Australian Curriculum, with specific facilities to enrich learning in the arts, music, and Science, Technology, Engineering and Mathematics (STEM) to ensure we are equipping students for the best possible future. The new school will welcome its first students on the first day of the 2019 school year. 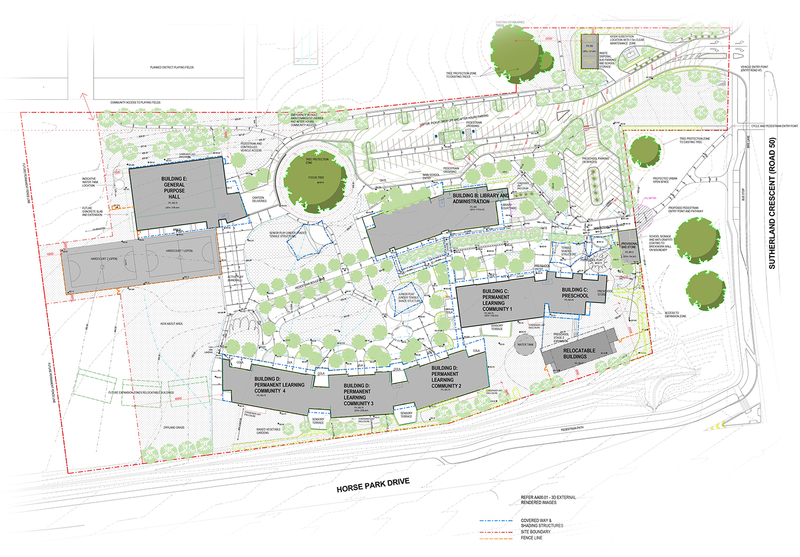 The Priority Enrolment Area for the new school includes the suburbs of Moncrieff, Taylor and Casey, which is a shared PEA zone for Gold Creek School. 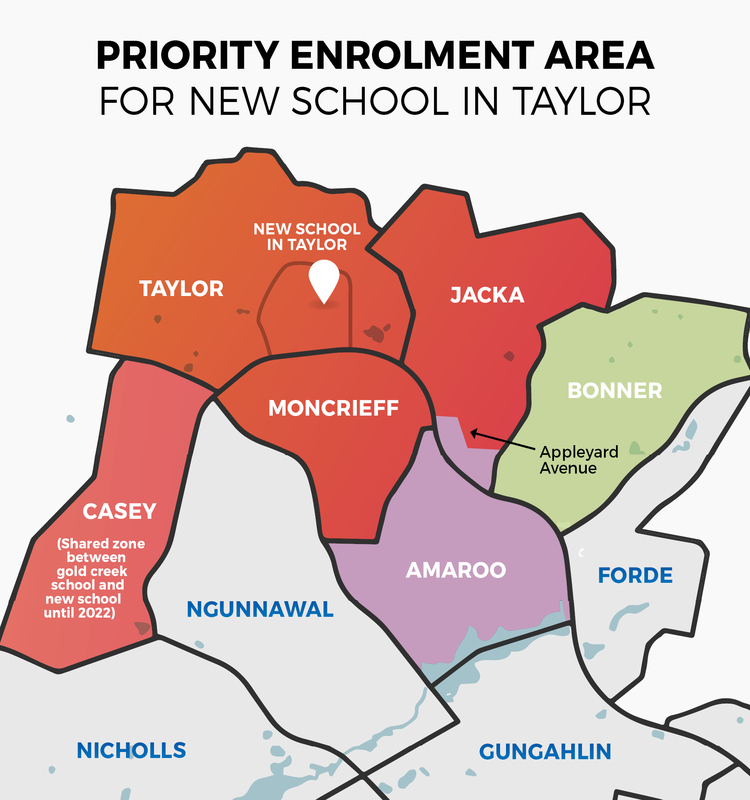 In the meantime, families who move into the suburbs of Moncrieff and Taylor are welcome to enrol their children at Amaroo School until the new P-6 school opens at the start of 2019. If you would like to know more about enrolling your children please visit https://www.education.act.gov.au/school_education/... or contact margarethendry@ed.act.edu.au or call 6205 3313. Margaret Hendry School was selected by the community as the favourite name for the new school. The Education Directorate requested options, including Indigenous and female names from the Office of the Surveyor-General and Land Information and the Place Names Committee and three options were chosen based on their cultural, historical or geographical significance to the local community. Margaret Hendry was a landscape architect with the National Capital Development Commission from 1963 to 1974. She was the first woman appointed and one of only five female landscape architects in Australia at that time. She played a significant role in shaping the landscape in the National Capital including the Cotter Dam Recreational Reserve, Gungahlin Cemetery, Belconnen Town Centre and many playing fields, housing areas and shopping centres were wholly or partially designed by her. In 1974 Margaret Hendry was appointed Senior Lecturer in Landscape Design in the School of Environmental Design at the Canberra College of Advanced Education (later University of Canberra). She lectured and published professional papers for a variety of organisations: conferences, universities, colleges, pre-school bodies, horticultural and garden clubs, institutes of parks and recreation and many women’s organisations. Margaret Hendry was a key player in the establishment of the Australian Institute of Landscape Architects and in 1966 became an inaugural corporate member. In 1972 she was elevated to Fellow of the AILA. As well as her contribution to landscape architecture she served as President of the Soroptimist Club in Canberra, President of the Business and Professional Women’s Clubs (NSW Division), was a member of the Women’s Advisory Board to the NSW Government and worked hard to improve the status of women and lobbied for many issues from equal pay for women to equal legal rights for step-children. Margaret Hendry retired in 1985 due to ill health, but continued in consultancy roles, sat on jury panels for landscape competitions and advised on urban tree issues. In 1992 she was awarded the Medal of the Order of Australia for her service to the community, for her efforts in seeking equality for women and for her significance as a role model for women in landscape architecture. Why wasn't ‘Taylor’ one of the options? Consideration was given to naming the school ‘Taylor’ after the person of whom the suburb of Taylor is named, Florence Taylor. The name 'Florence Taylor Primary School' was seen as too similar to the existing school, Taylor Primary School (located in Kambah) and Florence Taylor Street in Greenway and may cause issues for the ACT Emergency Service Agency. Concepts were created for the uniform, with design choices based on gender neutrality, ease of manufacture and distinctiveness from other schools in the area. Please note that designs are conceptual and will be finalised once a uniform supplier is confirmed. A series of designs were created, with each representing a significant area of the school, including themes such as the local plant and animal life, and references to the proposed names. Thank you for helping choose the name, logo and uniform of Canberra's newest school. Mingle Moncrieff Residents Catchup at Amaroo School. Come along and learn more about the choices available for the school name, uniform and logo.